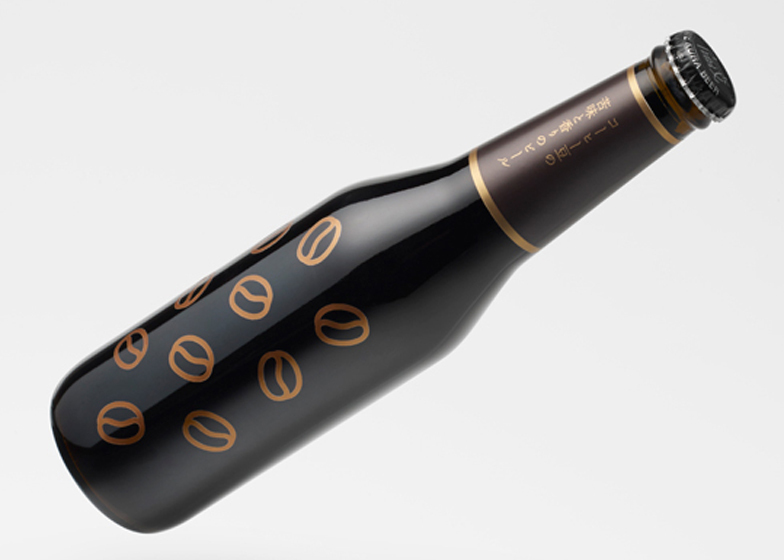 Japanese studio Nendo has designed packaging for coffee-flavoured beer by adding little bean-shaped stickers to the brewer's existing bottles. "Adding coffee beans to beer during the brewing process gives the resulting beer a rich, deep taste, thanks to the beans' bitterness and aroma," says Nendo. The studio created the packaging for a collaboration between Anchor Coffee of Kesennuma city and Sekinoichi brewery of Ichinoseki city, both located in northern Japan. "Both Kesennuma and Ichinoseki were devastated by the earthquake and tsunami of March 2011, so the beer is a charity project to fundraise for disaster relief," the designers explain. To keep costs down they used the brewer's existing bottles and simply created stickers that are applied by hand so each Coffee Beer bottle is unique. "Large beer breweries who produce standard products on a mass scale simply can't offer products like this one, and that's the point," the designers add. "We wanted the packaging to convey the makers' thoughts and feelings with each bottle." The most controversial (and expensive) beer packaging we've ever featured was made out of roadkill. Other innovative packaging designs we've featured includes laser tattoos for fruit instead of stickers, medicines labelled with symptoms rather than ingredients and famous products without the brand names written on them. Other recent projects by Nendo include a combined shower and light for tap company Axor, offices that look like the walls are peeling away and a footwear shop full of ghostly white shoes. Photos are by Hiroshi Iwasaki.